Livestock farming and agriculture have traditionally been important in the Northern Netherlands. The agricultural sector has always been pioneering and is still doing so today; to increase their own yield, but also to contribute to a good, sustainable global food supply. Agricultural land is lost through salinization and desertification, yet the global demand for good quality food is rising due to population growth and increasing prosperity. 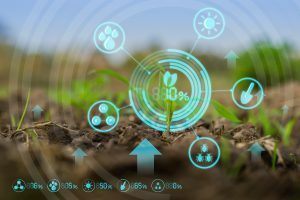 In order to ensure a sustainable agricultural sector that produces enough and good food for the growing world population, innovation is required. Working on this innovation, farmers in the Northern Netherlands are collaborating with knowledge institutes and governments. Science and food production are literally very close together in the Northern Netherlands. For example, the potato giant Avebe opened an innovation centre on Zernike Campus in Groningen, close to researchers and students from the University of Groningen and the Hanze University of Applied Sciences. The Innolab Agrifood is developing innovations in the field of potato starch and potato protein, and offers startups space to bring new knowledge to market. Not much further away, the Carbohydrate Competence Center (CCC) is encouraging public-private collaboration between knowledge institutions and companies to create high-quality knowledge about carbohydrates. This knowledge is used in the food industry, but carbohydrates can also play an important role in greening the industry. Just outside of Leeuwarden, on the Dairy Campus, dairy farms and knowledge institutes from the region and beyond are developing knowledge and innovations for a sustainable dairy sector. With a drone and sensors, farmland can be mapped very accurately from the air. By analysing the data, a farmer knows exactly how much to irrigate, where to fertilise and how to better plan his harvest. With this in mind, 21-year-old student and crop farmer Wilco Stollenga developed the Agrifly drone. This should not only improve the yield of an individual farmer, but the technology also contributes to a more sustainable food supply. Collaboration with knowledge institutes in the North helps the Agrifly make better analyses. And to enable data analyses from the moment of take-off, Agrifly is participating in an experiment with 5G, a high-speed mobile internet connection for which a testing ground is being set up in North Groningen. In the German-Dutch sensors project Id3as, northern provinces, knowledge institutions and other partners are investigating how sensors can contribute to monitoring the fertilisation of farmland.